Ds Kitchens & Interiors wants to thank all our customers for taking time to write a few words about our work. This will provide our future customers a better understanding about our standards, care and effort that we put in every project that we embrace. We encourage everyone before contract any company to get references and valid testimonials as what we stand for. My wife and I contracted DS Kitchens to renovate our Kitchen in 2015. John’s dedication and passion for cabinetry is second to none. He listened to all our requests and kept us well informed throughout the process. We found John to be fair, honest and professional in his work. He was able to design, deliver and install our kitchen in a timely fashion. We were very happy with the outcome. John’s knowledge of kitchen design along with his great customer service skills helped make this renovation a pleasant experience. We would definitely recommend DS Kitchens to anyone who is looking to update their cabinets. I can’t speak highly enough of John de Sa. The cabinets designed, constructed and installed by DS Kitchens are everything we hoped for and more. At every step of the process, it was a pleasure to work with John. Right from the start, at our first design meetings, we were impressed by his expertise and ability to explain our options, many of which we didn’t even know we had. He was transparent, helpful with suggestions and knowledgeable of his craft. He kept within budget, maintained a clean worksite and he was always on time. He provided us options that made us confident our best interest was foremost in his mind. The price was fair and the quality of workmanship exceptional. Working in an old house, with other trades going on at the same time, was bound to complicate things. John, always the exemplary professional, accommodated us every step of the way. He delivered on every promise and has returned to make minor alterations and fixes. In the end, he was able to exceed expectations. I would not hesitate to recommend John for any custom cabinetry you are considering. Sometime in July we were very lucky to have been introduced to John de Sa from Ds Kitchens. We had waited 28 years for us to be able to have a complete kitchen makeover. John came to our home and got a feeling of what we wanted, but John was the professional and he had some amazing ideas for us. He came back to us with some wonderful drawings of what our dream kitchen would look like. John helped organize all the people that would be required to put the kitchen together. Whenever John said, he was coming he never let us down he always arrived on time. We have never untaken such a large project before and with John's guidance we now are the proud owners of a marvelous kitchen. My husband and I would highly recommend John. There is no way that we could thank him enough. We were told at that time we will get a better quality product with the less money and it was then we decided to shop around for contractors. relied on business listings and some referrals to obtain quotes and sample pricing. We were glad to have found John. He is fast, reliable and most of all, very detailed in his work. We will use him again in our future projects and we highly recommend him to our customers and friends. thank you for your high quality standards in your craftsmanship.Your attention to design and detail has left us with a stunning kitchen for our entire family to use.We highly recommend John for all renovating and remodeling needs. We found him to be professional, reliable, patient, knowledgeable and a pleasure to have in our home. John has done work in several of our houses and brings the same quality of craftsmanship that only a seasoned professional can deliver. Without fail John has always made our homes look and feel like a million bucks. Most recently John added crown molding and built in units for us and everyone that sees it wants to use him for their projects. We don't lightly make recommendations but John is one that we make without hesitation. We look forward to dealing with John again in the future. We didn't have to shop around for someone to renovate our kitchen as John de Sa did such a wonderful job of our crown moulding several years before. There was no doubt we would want him back for any home changes we would make in the future. It isn't hard to see John is proud of his work. Every detail has his exact attention, which results in perfect construction. Not only is the kitchen all we hoped for, but above our expectations due to little extras John provided that we had never thought of. John is an honest, reliable, conscientious craftsman, very friendly and a pleasure to have in your home. We most certainly would recommend him. "John has been a big help in solving my storage issues when I downsized from a 3-bedroom house to a 1-bedroom plus den condo. He has provided valuable suggestions in maximizing the storage that I can have in a small space. The end result is I have ample storage and beautiful cabinetry! The project is on time and within budget. I've been very lucky to be referred to John and trusted his professionalism to get the job well done. I would have no hesitation in referring John to anyone. John, wishing you prosperity in the years to come and great health! When we made the decision to do a full renovation of our kitchen (floor, walls, plumbing, cabinets etc) we sourced Kitchen companies through references, referrals, and web searches. We finally narrowed our search to three companies including DS Kitchens. John was extremely knowledgeable, organized and professional through the entire experience from initial meeting, drawings, quotations, build and install. John met all his commitments regarding timing, pricing and quality never giving us any opportunity to question our decision. Our kitchen is absolutely stunning. John created a custom kitchen that incorporates all of our design elements and John's eye for detail and knowledge of the process from design through install. We are the envy of our neighbours, and constantly receive feedback from everyone that comes into our home. Please feel free to ask John to request a visit to see his work inside our home. 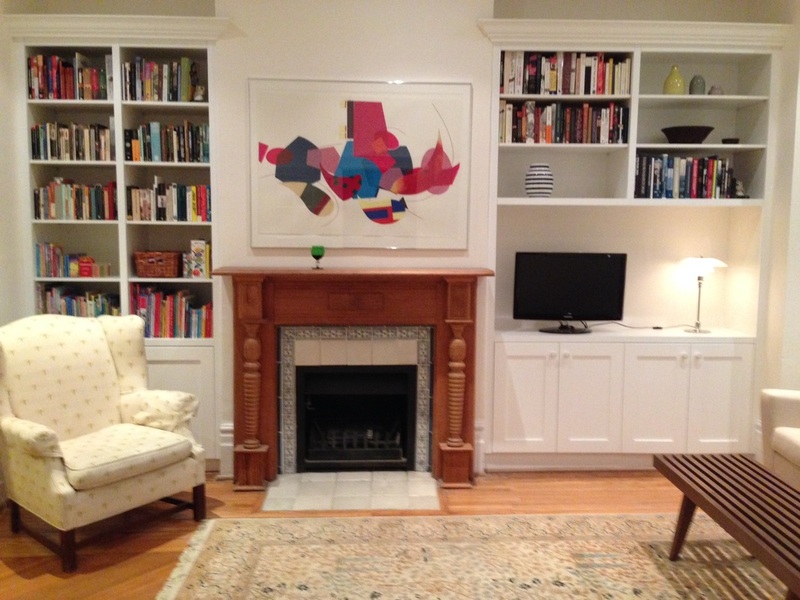 John de Sa of DS Kitchens and Interiors redesigned the built-in bookshelves in our living room. He created a contemporary design, as requested, and managed to significantly reduce the cost of the project by suggesting alternative materials, but without compromising the final aesthetic appearance or quality of the unit. The bookshelves were built and installed on time and on budget. The house where we live is old, with shifted walls and floors, but John did a masterful job of fitting the bookshelves appropriately. In addition, he was cheerful, professional, and an all around pleasure to meet. We give our unqualified recommendation of his services to other potential customers. were lucky to meet John de Sa of DS Kitchens and Interiors. The project came in on time, on budget, and with friendly follow up for minor adjustments. 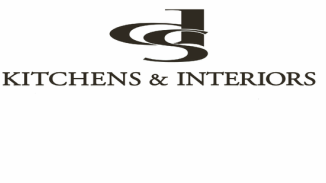 recommend DS Kitchens and Interiors as a company of choice. I have Known John de Sa for many years and have had the pleasure of dealing with him several times..
Over the years John has built 3 kitchens for me. John is an artist .. He works with you and he really listens. Having dealt with many workers over the years during my many renovations one of the qualities that John has and that I treasure is HIS WORD..
if he says he is going to show up..he will.. If he says its going to be ready..it will..
That alone is a great asset..but most importantly John's work is just flawless.. I have and will continue to recommend John to anyone that asks .. I remodeled my Condo kitchen and hired John from DS Kitchen & Interiors to design and build my cabinets. Being a single female the whole re-modelling project was somewhat scary at times. There was so much that I did not know and lots of decisions I need assistance with. John is not only a champion at his trade; he was completely supportive throughout the entire process. His workmanship is professional and exceptional and my kitchen is simply divine. I will not hesitate to refer John and DS Kitchen & Interiors. When we bought our house, the kitchen cabinets had been recently renovated, but we wanted to add an island that matched. We learned from the previous owners that John de Sa had built the kitchen. We contacted him to build our island and we could not be more satisfied! John remembered the house and quickly came over to discuss our needs. He built a beautiful island that matches the kitchen perfectly. From beginning to end, John was extremely helpful and just a pleasure to work with. We even got him to fix a few other things in the kitchen, which he did for a very reasonable price. We would not hesitate to call John for any other renovations or to recommend him to anyone looking for custom cabinets! In the summer of 2013, John de Sa was the contractor for the renovation of the kitchen at the above address. The work involved the re-facing of the existing cupboards and drawers, the design and supply of a new kitchen sink/dishwasher unit, re-wiring of electrical outlets, replacement of existing lighting, provision and installation of stove ventilation and lighting, plastering and painting. All the work involved was completed in a timely manner and to the standards that we had specified, and was also within budget. We would strongly recommend Mr. de Sa to anyone who is considering undertaking any renovation work in their home. Apart from the high quality of his work, we found Mr. de Sa a pleasure to deal with. with John De Sa from DS Kitchens. were given was exact, there were no hidden fees or surprises. sure he cleaned up at the end of each day. that we would be more than satisfied with the finished product. ideas and answered all of our questions. John met all timelines as he said he would and was very helpful in co-ordinating other trades that were necessary for the project. John is very trustworthy and we had no concerns leaving him to work in the home while we were out. Since the initial project, we have continued to hire John for other projects in our home. We would definitely give him a strong recommendation. We just got in the door and are totally knocked out by what you have created for us! The execution of the plan is masterful----- perfect and flawless. We cannot wait to see the finished product and put it to use. It is great storage and adds immeasurably to the look and value of our home. Kudos! Thanks so much. We know that you stayed late just to get us excited. It worked! success in any way you choose to "grow" your business. John de Sa has been working in our home making improvements for a number of years. John has been a pleasure to work with. He is personable and an excellent craftsman. John always keeps to scheduled appointment times and his work is of the highest quality. A real estate appraiser categorized it as the best quality he has inspected. He never considers a job complete until everything is perfect. John’s estimate is always close to the actual, and his completed costs have never changed from the estimate. 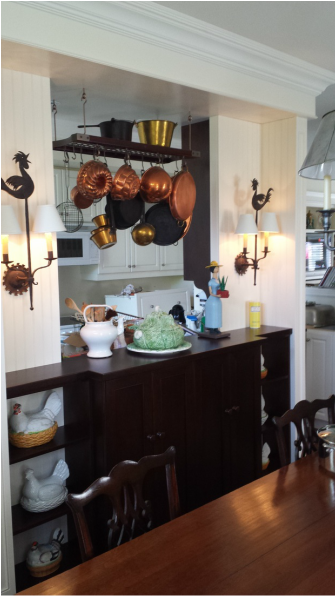 John completed a kitchen renovation while we were on a 6 week vacation. John sketched the layout and had the drawings completed by an architect. John scheduled, and monitored, the plumber, electrician and flooring trades. On our return the kitchen was almost complete, but ready to be used. John also scheduled a cleaning company to clean the whole house before we returned. 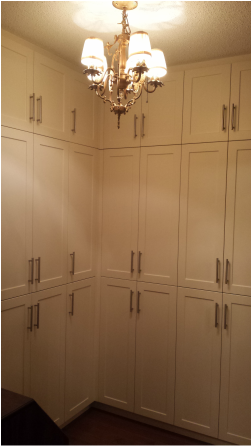 Recently John renovated our walk-in closet. The cabinets and drawers are the highest wood quality, and the color is to our exact specifications. John’s design maximizes the space to it’s full potential. We recommend John for all renovation work. 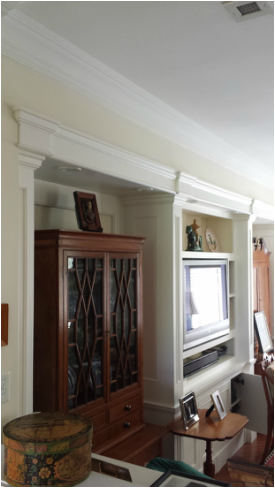 "We are extremely happy with John's cabinetry work. We love the look of our updated kitchen. John's attention to detail and his friendly manner made him a pleasure to work with. We'd highly recommend him".